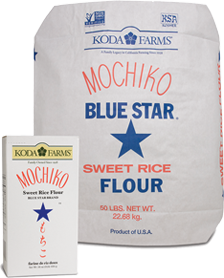 Blue Star® Mochiko Sweet Rice Flour is unique among all varieties of rice flour due to its starch composition of nearly pure amylopectin. This characteristic makes it very viscous and useful as a superior, gluten-free thickening agent. Our flour has been milled on our farm since the 1940s and composed of California farmed, pure, unadulterated short grain sweet rice. No additives of any kind are added. Mild and neutral in flavor, popular Japanese applications include homemade microwave mochi, manju, chi-chi-dango, and arare (rice crackers). Our milling facilities are dedicated exclusively to the production of rice products. Moist and dense, a perfect application for our flour. Melt butter with chocolate in top of a double boiler setup over simmering water. Set aside. Mix Mochiko, baking powder, salt, and walnuts together and set aside. In a medium bowl, with electric mixer (at medium speed) beat together the eggs, sugar, and vanilla until mixture is thick and pale yellow in color. Take cooled (but still relatively fluid) chocolate/butter mixture and dribble it into the egg/sugar mixture, stirring all the while until thoroughly incorporated. Fold in Mochiko/dry ingredients mixture until barely incorporated. Transfer mixture to prepped baking pan and bake for approximately 35 minutes, or until a toothpick comes clean. This is very similar to a Filipino style Bibingka, though authentic versions will often utilize whole kernel sweet rice instead of the flour. Rich, with a heavy tooth! Melt butter in a small saucepan over low medium heat. Thoroughly mix flour and sugars together in a large bowl. Mix milks, eggs, and melted butter together before then adding to dry mixture. Combine all ingredients well, then pour mixture into a 9 x 13 inch baking pan lightly coated with non-stick cooking spray. Sprinkle with brown sugar to taste. Place in oven on middle rack and bake for approximately 50 minutes. Turn off heat and allow mochi to rest in oven for an additional 30 minutes before removing and cutting into small pieces. Sift the rice flour, sugar, baking powder and salt together into a bowl. Beat in the milk until the mixture has a smooth consistency. Add the beaten egg and vegetable oil and mix until just blended (do not over mix). Heat a heavy non-stick griddle, skillet, or shallow pan over medium high heat or until it is hot enough to bounce water droplets. Ladle the mixture onto the griddle to form cakes approximately 4 inches in diameter. Turn the cakes once the bottoms have browned and bubbles appear on the tops. Cook the cakes for an additional 2 minutes or to suit. Preheat oven to 350°F Grease two standard loaf pans and with parchment paper line the bottoms. With an electric mixer, cream butter and sugar until pale yellow in color. Add eggs one at a time, then lemon zest and juice. Mixture should be thoroughly blended and thick. Mix dry ingredients thoroughly in a separate bowl and then add to wet mixture a little at a time. After mixture is thoroughly blended, divide between the two loaf pans. Bake for 45 – 60 minutes, or until a toothpick comes clean (test in area of "split" on loaf tops). Remove from pan while still warm, remove paper from bottoms. Combine all ingredients in a small heavy saucepan and bring to a slow boil and simmer for approximately 10 minutes. To make filling, combine peanut butter and honey; refrigerate until firm, a few hours or overnight. To make mochi, bring water to a boil; add sugar and stir until dissolved. Add mochiko a little at a time, stirring constantly. Continue stirring over medium heat until lumps are dissolved. Mixture will be thick. Place dough on a surface dusted with katakuriko. Allow to cool slightly. Sprinkle with more katakuriko and knead a few times until smooth. Pinch off a 1 1/2 inch piece/ball of dough and flatten into a circle. Place a teaspoon of filling in the center. Fold edges around filling and pinch to seal. Present seam side down. Best consumed shortly after fabricating. Bring water to a boil; add sugar and stir until dissolved. Add Matcha water and stir. Add mochiko a little at a time, stirring constantly. Continue stirring over medium heat until lumps are dissolved. Place dough on a surface dusted with Kinako. Sprinkle with more kinako and knead a few times until smooth. Using a plastic disposable knife (these have a somewhat "non-stick" quality and simplify the process), cut the log into desired size wedges and roll in Kinako to cover all surfaces. This recipe was formulated with use of a 1250 watt oven. Cooking times may vary. Whisk the flour and water together until well blended. Optional, strain mixture through a sieve to improve texture. Pour mixture into prepared container and microwave on high for two and a half minutes. Remove from microwave. Mixture may look slightly translucent. Cool slightly and then invert onto floured work surface. While still warm, cut or pull the mochi apart and roll into desired pieces, using extra flour to facilitate the process.